It’s tough to get a restomod right. 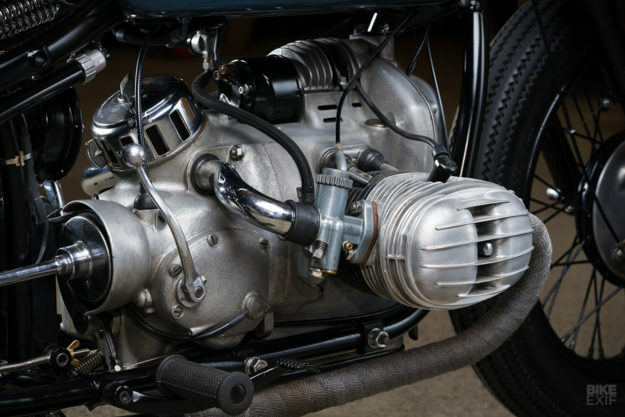 An authentic nuts-and-bolts restoration is more work, but at least you have a blueprint to follow. Knowing how much ‘mod’ to add to the mix—without treading on the spirit of the original—is an art. 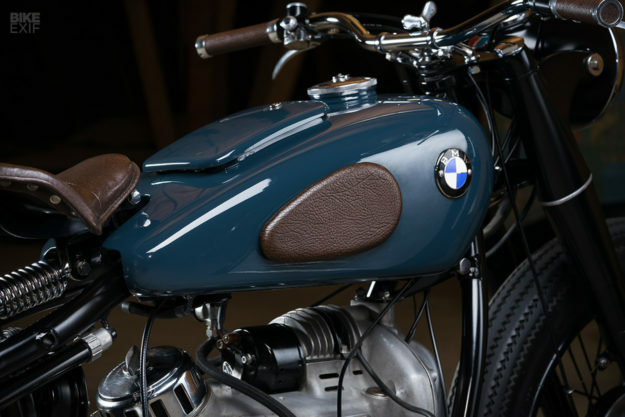 Some BMW historians might baulk at the sight of a vintage boxer with even a single mod. 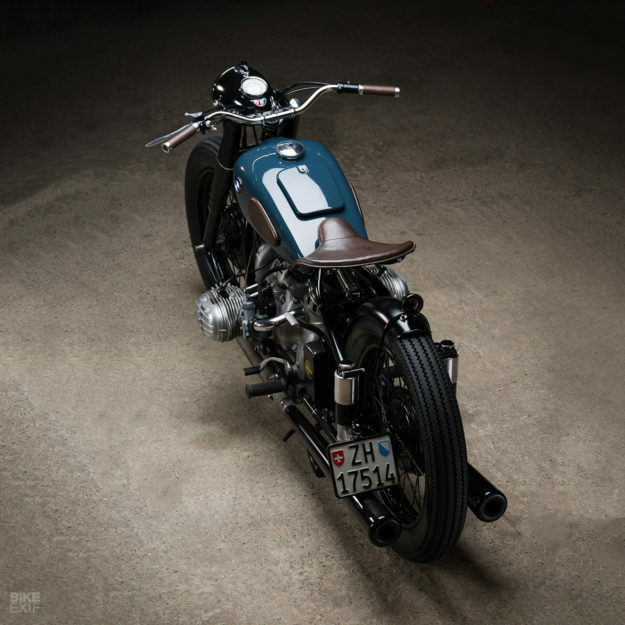 But we’re giving Ramon Seiler of Kontrast Kreations ten out of ten for this delightful petrol-blue bobber. Especially since it started out as a pick-n-mix basket case. 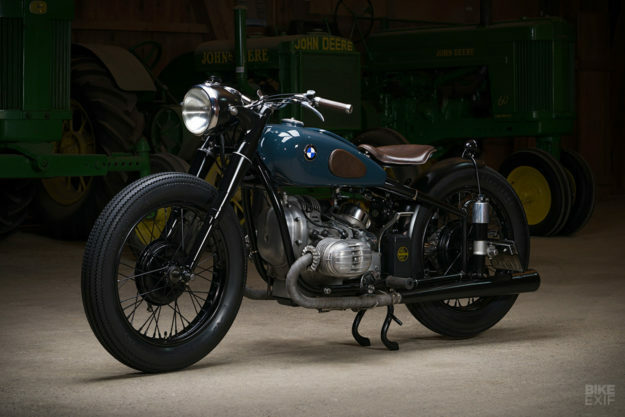 The bike’s new owner wasn’t keen on returning it to stock, so Ramon had some freedom to reimagine the vintage Beemer. But first, he had some repairing to do. Luckily, he’s no stranger to old vehicles. 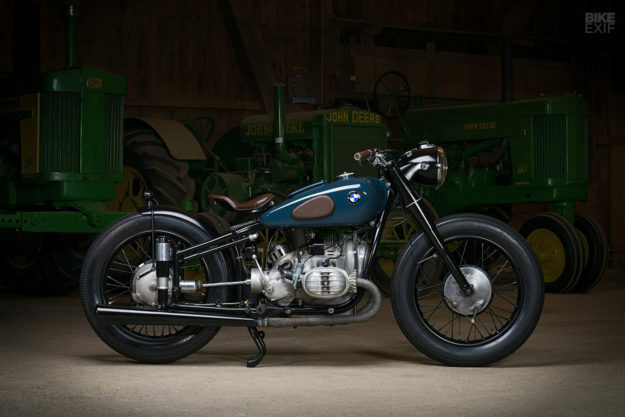 The last build we featured from him was a custom BMW, but he spends most of his time restoring classic cars and motorcycles from a workshop in the village of Bonstetten, near Zürich in Switzerland. He took apart the engine and gearbox, and rebuilt them with new seals. Then he painstakingly soldered and filed the broken case and missing fins, until it was impossible to tell that they’d ever been damaged. The R51/2 was only produced in 1950 and 1951, so there aren’t many around. And as you’d expect, parts are hard to come by. But since this one was already a mash up of various BMW bits, Ramon had no qualms continuing the theme. So he sourced some parts from the R51/2’s successor—the R51/3. These included a fuel tank, valve covers and a set of spoked wheels. The bike came with a pair of rare Phono exhausts, so those stayed. Just about everything on the old boxer needed welding, straightening or general wizardry to get it up to par. The wheels were relaced with new spokes, and repainted in semi-gloss black. A new wiring harness was made up, running close to the frame with neat hose clamps keeping it in check. Ramon also ditched all the worn-out rubber bits, like the seat and knee pads. He fabbed up a new seat pan to sit on the stock mounts, then made a pair of aluminum pieces for the tank. Everything was then sent to a local upholsterer to be wrapped in brown leather. 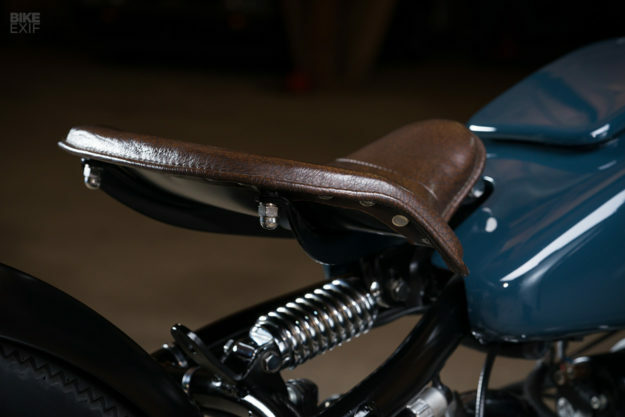 The effect is mimicked up top with a pair of Brooks bicycle grips; the throttle and grips both had to be modified to work together. 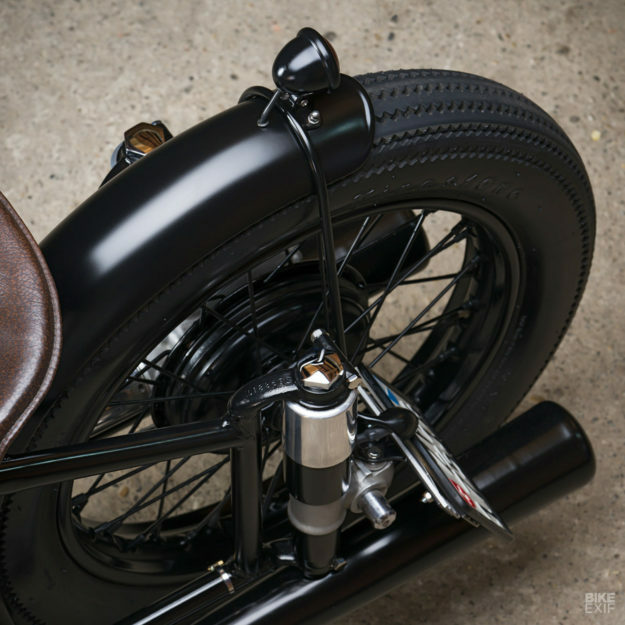 During the build, Ramon realized that the R51/2’s frame looked neat without the rear fender and the complex set of brackets that holds it. 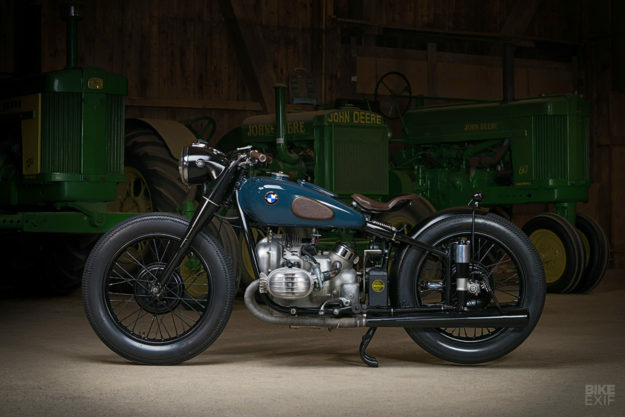 Running the bike fenderless wasn’t an option, so he found a solution that would work with the Beemer’s plunger rear suspension. A problem arose: the original fender was fixed to the frame, but the new design had to hug the rear tire and travel with it. 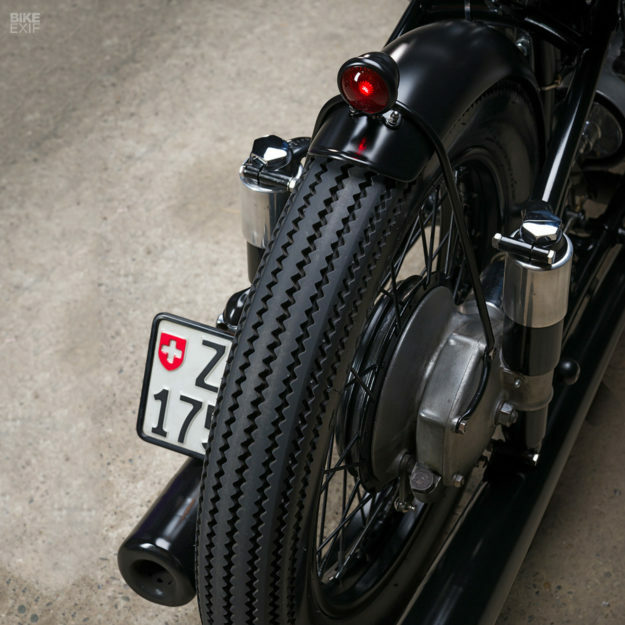 Ramon shaped a new fender from aluminum, then attached it to the final drive via a custom-made mount at the back, and to the frame via a steel hinge at the front. Between the hinge and the natural flex of the aluminum, the fender now syncs with the travel of the wheel, without any hassle. There’s also a custom-made license plate bracket out back, and a Bates-style tail light mounted up top. 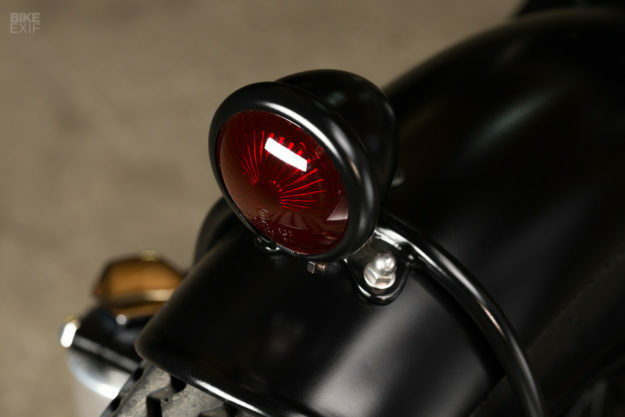 The tail light came kitted with LEDs out the box, but Ramon was dead set on keeping everything as vintage as possible, so he retro-fitted a 6V bulb. He’s kept the same philosophy up front. 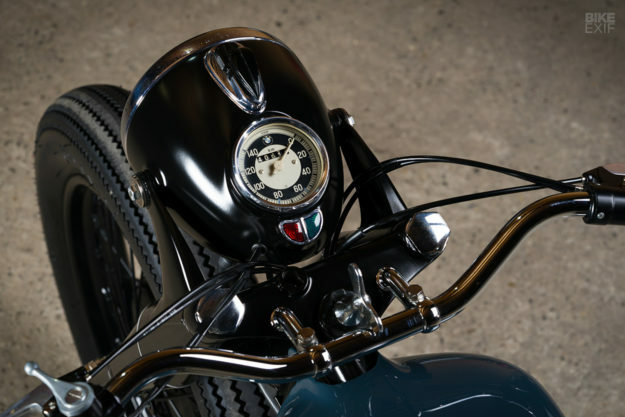 Rather than upgrade the entire cockpit with modern components, the headlight (and the speedo embedded in it) are still original. One thing Ramon did want to change though, was the BMW’s iconic black-with-white-striping paint job. 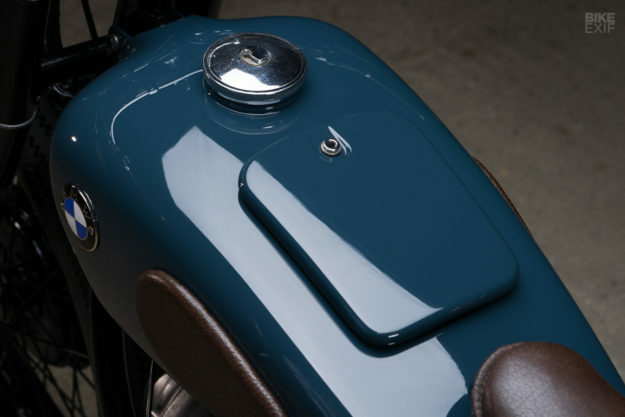 Petrol blue turned out to be the perfect substitute: it’s the least subtle change on the entire build, but it hasn’t dampened the vintage appeal.